I shot this photograph today, late afternoon, in Lipscani quarter of Bucharest, finding it evocative for the city’s atmosphere in wintertime. 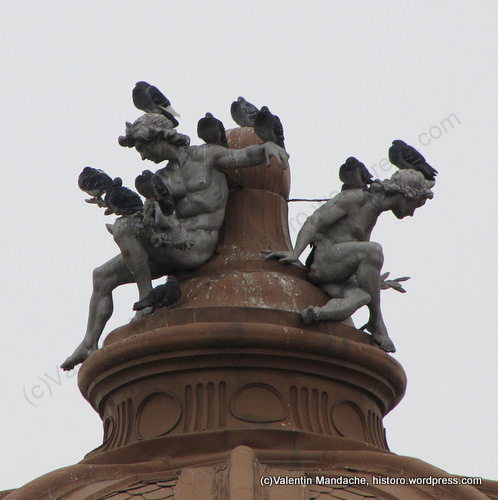 I like the contrast between the grey sky, fluffy-feathered pigeons, and suggestion of a forthcoming torrid summer conveyed by the two classical mythology personages that adorn the great cupola finial of an old shopping arcade, which dates from the La Belle Époque period. As the year is drawing to a close, I would like to invite you to a nocturnal architectural end-of-year tour in the area of Lipscani in Bucharest, the historic urban core of Romania’s capital and also its oldest market, open to all of you who would like to accompany me, the author of the Historic Houses of Romania blog, for two hours, between 18.00h – 20.00h, on Friday 30 December ’11! The meeting point is on the entrance staircase of the National Bank of Romania building on Lipscani Street, see the map bellow, at 17.45h – 18.00h, after which we will proceed for two hours to discover and admire, in the special atmosphere of the evening hours at the end of the year, what constitutes the historic and architectural essence of Bucharest. The streets of Lipscani are some of the best illuminated in Bucharest, therefore we will not have any problem in visualising its architecture at that particular time. The tour will end, for those who wish, at a Lipscani café or pub, where we can continue to exchange views and ideas over a coffee or beer. This once charming Art Nouveau building, dating from the end of the 1890s, has been ruined in a fire, during the property boom of the late 2000s in Bucharest. It is located in Lipscani, the old commercial quarter of Bucharest, an area that for a decade and a half after the fall of communism was left derelict by the city authorities, despite its obvious huge tourist potential. During the last property boom, many historic buildings in the area were targeted by rapacious property developers for the valuable land plots which they occupy. A favourite method of destruction, in order to obtain the much coveted demolition permit for historic buildings, was the arson, usually blamed on squatters who sometime occupied those properties. Lipscani has started in the last two years to experience a sort of a renaissance as a place full of cafes and restaurants and it is just hopped that such an entrepreneur would revive or least save the beautiful Art Nouveau façade of this building. Bellow are recent photographs containing details of these rare for Bucharest type of ornaments. The National Bank of Romania is located in the Lipscani historic quarter of Bucharest in a large neoclassical complex of buildings built in two stages: 1st in the 1880s and 2nd in the 1930s. The 19th century sector is in my opinion the more interesting and attractive one, boasting a worthy of note neoclassical style adorned with beautiful statues, seemingly inspired from French 17th century palaces. The construction of that building was finished in 1890 under the direction of architect Nicolae Cerkez. The old postcard bellow dating from the first decade of the 20th century shows the bank in a surround setting which has not changed very much since its inauguration. The façade of the building, which is oriented to the south, is embellished with a series of allegorical sculptures inspired from the classical pantheon, symbolising the society and economy of Romania. Amazingly the sculptures still retain their initial freshness and sharpness after a century and two decades since they were affixed on the wall. That is because Bucharest has been much less affected by acid rains and corrosive pollution than other European capitals, as a result of the lower degree of industrialisation which the communist regime was able to achieve in Romania. The stone used for the façade and sculptures also seems of very good quality- a type of yellowish calcareous stone, which according to Romania’s National Bank website was brought from the area of Rustchuk, today Ruse in Bulgaria. On the eastern flank of the panoply is a male figure, again sitting on a stack of books, with a papyri scroll in his hands.